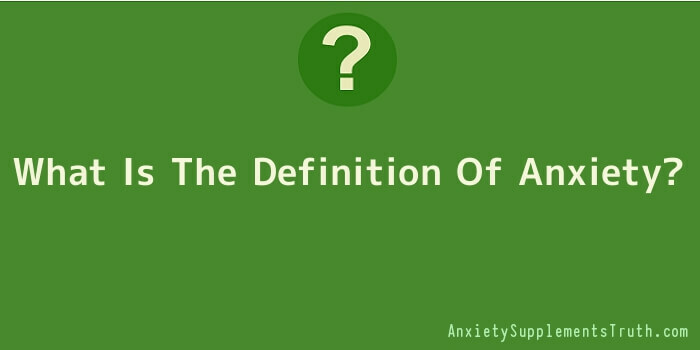 If you have Googled “define anxiety, anxiety definition” or “definition of anxiety” you have done it for a reason. Either you are researching anxiety out of curiosity or you have started to feel that your own reaction to anxiety is inappropriate. It may be that you are experiencing unusually high levels of anxiety or even panic attacks. If so; read on. Did that help? Are you any closer to knowing if you have an anxiety disorder or not? One of the problems with diagnosing any anxiety disorder and especially self diagnosis of an anxiety disorder is that a certain level of anxiety is the norm. All of us experience anxiety about different situations and most of us cope with it most of the time, simply accepting that a certain level of anxiety is perfectly normal. So how do we know if our reaction is abnormal? The problem with anxiety and anxiety disorders is that they are something that is experienced on a very individual basis. All of us are capable of feeling anxious about a variety of situations that we find ourselves in, but why do some go on to develop an anxiety disorder and how do we know when we have. Anyone who suffers from an anxiety disorder will have developed the problem in their own way, from their own life experiences. Ask any two anxiety sufferers what caused their anxiety disorder and you will never get the same answer. Anxiety is the body’s reaction to a perceived threat. That is a simple explanation of a hugely complicated subject. Our bodies react to threats in a variety of ways in exactly the same way as animals react to danger. This is perfectly normal and natural and was originally part of our survival mechanism. Where it starts to go wrong is when instead of reacting to real threats, we start to react to imagined threats. This is something that is thought to be a uniquely human ability. Anxiety disorder is thought to be something that only experienced by humans. Our memory and imagination allows us to move backwards and forwards in time, remembering situations in which we felt threatened and imagining similar situations that we could come across in the future. It is this ability to remember and imagine threats and danger that allows us to, and sometimes conditions us to, react to imagined dangers. Post traumatic syndrome is an extreme example of this, where the feelings of danger and threat that someone experienced in the past can trigger irrational fear or anxiety in the present. It also demonstrates that a large proportion of an anxiety disorder is the result of anticipating future events. If we weren’t able to think in terms of the past and future, if we couldn’t relate past experience to predicted future events we would be incapable of suffering from an anxiety disorder. An anxiety disorder can essentially come about in one of two ways. It could for example be the result of a sudden trauma such as the death of a loved one. Divorce or job losses are both events that have been known to set off an anxiety disorder. Alternatively, it may be a series of smaller events coming one after another that gradually conditions us to think in an anxious way so that our reaction to anxiety becomes extreme. It is almost as if the natural level of anxiety that we experience on a day to day basis has changed so that even a small amount of additional anxiety will cause us to overreact, feeling extreme anxiety in a situation which we would normally cope with. So, if you think that you have developed an anxiety disorder what symptoms should you be aware of. These can really be split into two. Mental symptoms of an anxiety disorder. It is now estimated that anything up to 17% of people in the western world will suffer from some sort of anxiety disorder at some point in their lives. Consequently there is a fair bit of research going on and new symptoms are being recognised all the time but here are the most common ones. You can experience muscular pain or muscle spasms, a feeling of twitching in your muscles. A sudden and uncontrollable need to go to the toilet. Being startled by sudden movements or noises that would not normally trouble you. This is by no means an exhaustive list of the physical symptoms of anxiety. People suffering from an anxiety disorder can become more susceptible to general illnesses like coughs and colds simply because they become run down and exhausted. When you suffer from anxiety your body will play tricks on you. The physical symptoms of anxiety are your body’s over-reaction to the underlying anxiety. You can also experience a wide range of mental symptoms. Depersonalisation and depersonalisation: These are feelings almost of an out of body experience, being in a dream like state as if you are watching what is happening to you rather than experiencing it. Feel emotionally numb almost as if you are unable to react to things in a normal way. You can become very self absorbed, dwelling on your thoughts and emotions constantly. Not feeling like yourself, almost not recognising the way in which you are thinking. Giving a definition of anxiety is difficult simply because everyone will experience anxiety in a different way. People suffering from an anxiety disorder will experience some symptoms but not others. They may experience symptoms that are not on this list. Each of us develops anxiety in a different way and each of us will experience it differently. What is anxiety? This question must be answered before it is possible to fully understand the causes of anxiety. Anxiety is brought about by fear, usually a fear that the sufferer is in some kind of danger. This is what brings on the feelings of panic and distress. When we sense danger our body will react in many different ways such as pains in the chest, stomach pain or heart palpitations for example. These are all symptoms of anxiety, the body’s way of preparing itself to deal with the danger. 1. A person who has experienced some kind of major trauma in their life may be more likely to suffer from anxiety attacks. For example someone who lost a close family member suddenly or perhaps has suffered physical or mental abuse over a long period of time or was perhaps involved in some sort of accident. 2. The effect of drugs bought illegally on the street such as Ecstasy or LSD to name a couple can cause the addict to suffer symptoms of anxiety. Something you may not be aware of if you are an anxiety sufferer avoid coffee. The chemical in coffee called caffeine can exacerbate anxiety symptoms greatly. 3. It is possible that anxiety can be hereditary; it can be in the genetic make-up. Research has shown that in identical twins where one develops acute anxiety the other twin has a greatly increase chance of also showing symptoms. 4. An individual’s personality can also have a great influence on their mental health. Someone who has very low self esteem and lacks confidence in themselves is more likely to develop an anxiety disorder. It is also possible for someone who has suffered from anxiety disorders as a child to have very little self confidence as an adult. 5. Any stressful situation can cause anxiety symptoms for example the breakup of a marriage, moving house or starting a new job. Anxiety can be caused by many different things. Everyone at sometime in their lives feel anxious particularly if they find themselves outside their own comfort zone. Exams are a great example where most people get very uneasy and nervous possibly because they are frightened of failure and of what others will think and say if they do fail. What is anxiety? Hopefully, this will have answered the question and gone some way to showing what the causes of anxiety can be. If you recognise any symptoms which you suffer regularly, there is help available in any forms. Treatment does work so, get help do not suffer alone.